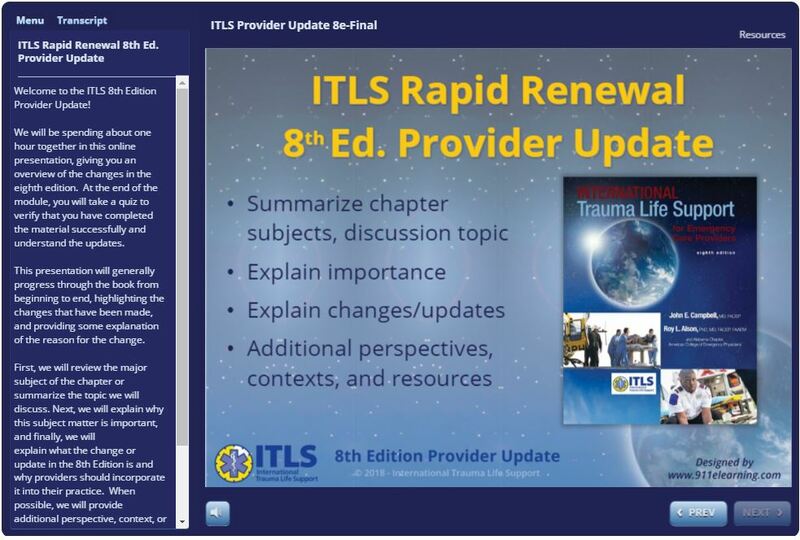 The ITLS Rapid Renewal Provider Update is a blended-learning program from ITLS that combines an online component with the Written Exam and Patient Assessment Practical Exam in the classroom setting to allow you to quickly, easily and effectively renew your ITLS Provider certification. You must hold a current, valid ITLS Basic or Advanced Provider certification to be eligible to renew through the ITLS Rapid Renewal Provider Update program. If your Provider certification is expired, please contact your local Chapter or Training Centre to inquire about eligibility. Purchase and complete the Rapid Renewal Provider Update, a 1-hour online course. A 10-question quiz is built into the end of the course module; a score of 80% or higher is required for successful completion. You may retake the quiz as many times as necessary to achieve the passing score. Print your Course Completion Certificate after successful completion of the Rapid Renewal Provider Update Quiz. This certificate is required for entry into the classroom Testing Component. Contact your local Chapter or Training Centre to set up a Testing Component appointment. At the Testing Component, complete and pass the Written Exam (score of 74% or higher) and Patient Assessment Practical Exam (rating of Adequate, Good, or Excellent). Receive your ITLS Provider Recertification card and certificate from your local Chapter or Training Centre. You may use the Rapid Renewal Provider Update program to renew your ITLS Provider certification up to 1 year before the expiration of your current certification. Note that this program can be taken only once; it may not be used to renew your card multiple times.